Vicodin withdrawal side effects include erratic moods, nausea, vomiting, and sleep disturbance. 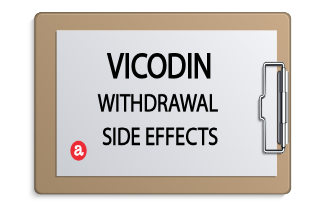 More on how to address Vicodin withdrawal side effects here. During Vicodin withdrawal treatment, side effects can have a large impact on your life. Symptoms can add stress to an already stressful process. While it takes time and energy to get your body back to normal, there are ways to ease symptoms of withdrawal. Continue here for more about Vicodin withdrawal side effects. Then, we invite your questions about Vicodin withdrawal at the end. Vicodin, like most opioids, suppresses pain receptors in the brain while relaxing smooth muscle. But the longer you’re on Vicodin, the greater the chance of developing physical dependence on the narcotic. When you’re dependent on Vicodin and stop taking it, you’ll experience withdrawal. Withdrawal may be an indicator of Vicodin addiction symptoms, but this is not always necessarily the case. Vicodin dependence is clinically different than Vicodin addiction, which is both physical and psychological in nature. Why do withdrawal effects of Vicodin occur? Withdrawal happens because the brain is trying to compensate for no longer having hydrocodone in the system. During withdrawal, the body tries to reconfigure chemistry in the pathways of the brain to stabilize the central nervous system and get the body back to normalcy. Withdrawal can happen any time you’re physically dependent on Vicodin and you miss a dose of Vicodin or choose to quit taking it. You can expect onset of Vicodin side effects of withdrawal 6-8 hours after your last dose has worn off. Depending on the level of dependency, Vicodin withdrawal can continue for weeks to months until side effects fully resolve. What are the expected effects of Vicodin withdrawal? When any of these complications arise, seek medical help at soon as possible. You may be able to address particular symptoms, such as excessive diarrhea with over-the-counter medications. But, doctors can intercede for more serious side effects such as aspiration or cardiac arrest. It’s because of these potential complications that doctors recommended you taper your Vicodin doses instead of going cold turnkey. It is generally recommended that you try to avoid withdrawal side effects. You don’t have to needlessly go through the pain and uncomfortably of withdrawal if you don’t have to. Tapering your doses of Vicodin allows your body time to heal and slowly regulate itself. With each decreasing dose, your body adjusts without going into a panic. Tapering doses of Vicodin is much easier on the system and you can treat the minor withdrawal side effects as they arise instead of all at once. If other complications arise you and your doctor can help treat them in the following ways. Seizures – There are drugs prescribed for epilepsy patients or with Parkinsonism that help to ease seizures and tremors associated with opioid withdrawal. One such medication is carbamazepine which is considered and anticonvulsant. If you are seizing or experience severe complication it’s best to get yourself to a medical facility. There they can monitor your withdrawal process and help give you anti diarrhea anti vomiting medication to take to edge off of the more severe symptoms of withdrawal. Mood disorders – You may also experience severe changes in mood during Vicodin withdrawal. severe anxiety or depression can make it really difficult to not start taking Vicodin again. At this point, a doctor might give you an anti-anxiety and/or antidepressant medication. You can also help treat these side effects naturally if you are not in the eye of the storm. Acupuncture can help with stress or you can use medication or exercise to ease these side effects. Relapse – Relapse is another big complication that arises, especially when Vicodin detox is part of getting help with Vicodin addiction. When you relapse, you continue to put your body in a compromising situation. If you need to withdraw from Vicodin and don’t feel like you can do it on your own, seek out a detox or addiction treatment facility. Medical staff can monitor your withdrawal and help you with the psychosocial side effects and triggers that can lead to relapse. Withdrawal side effects can be uncomfortable and frustrating. But they don’t have to be severe. If you still have questions regarding the side effects of Vicodin withdrawal, please ask. We respond to all legitimate questions personally and promptly. And we will get back to your questions as quickly as we can. Withdrawals make relapse a very real enemy. I’ll be the first to tell you that there are a million things I’d rather do than suffer from withdrawal. I’ve read some stuff about opiate drug blockers to help with relapse. It’s call Naltrexone. See for yourself. How long do side effects of Vicodin last?